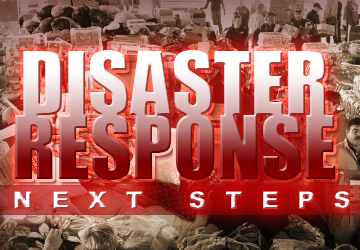 The Central Texas Conference’s Early Response Team (ERT) is a disaster response ministry that trains individuals and teams to respond to disasters within the conference, the country and the world – pretty much any location dealing with disaster. The mission of our conference’s ERT is to provide a caring presence in the aftermath of a disaster under very specific guidelines. The proven and effective guidelines enable a team to be productive and caring without being a burden to the affected community. At this time, Rev. Laraine Waughtal, CTC Disaster Response Coordinator, is in West, Texas, organizing and preparing for our trained and badged ERT workers to arrive. Another way that the good people of the Central Texas Conference can assist in times of tragedy is through United Methodist Volunteers in Mission (UMVIM). UMVIM team leaders are trained to organize teams for various mission work, such as construction, medical/dental assistance, evangelism, and more. UMVIM teams will be called into West to begin rebuilding as soon as the Early Response Teams finish their preliminary assessment and crisis management duties. If you are called to be a part of “Christian Love in Action”, Central Texas Conference has training classes for Emergency Disaster Response team members and United Methodist Volunteers in Mission Team Leaders coming up in the near future as well as throughout the year.